Maintaining your NFPT-CPT credential is an important part of long term success in the fitness training industry. Your credential requires upkeep in two forms: Continuing Education Credits (CECs) and a membership renewal fee. Both of these requirements work hand-in-hand. First, get CECs (with exception of cert year 1. You do not need CECs in your first year). Then, renew your certification membership. To get CECs, you participate in learning activities (of your choice), and then renew your certification ($85 renewal membership fee) in order to become recertified. We accept and approve health, fitness and business learning activities that you are participating in, outside of NFPT, and we give you credit (CECs) for it. 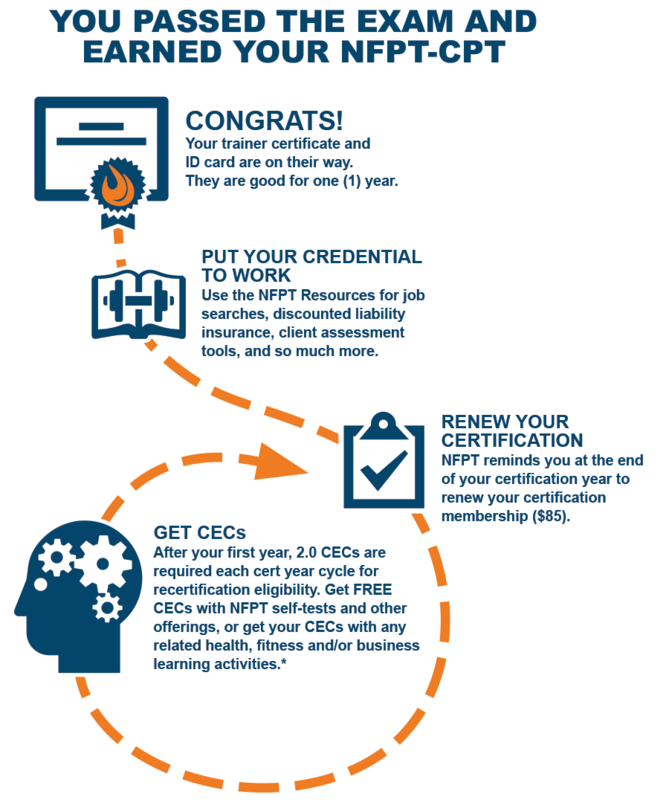 We provide you with an option for obtaining all of your annual 2.0 CECs for free each year, in your NFPT Account. We keep our annual renewal fee as low or lower than any other certification agency out there (even comparing with those that renew every 2 years, average out those costs and NFPT comes in lower). Certification agencies are a collective affiliation of members who, together, make a valuable contribution to their respective industry. At NFPT, we’re consistently growing in the area of trainer support services and resources for the trainer entrepreneur. Our organization is a family of fitness trainers, professionals, friends and partners working to make a difference in the health and well being of others. Join us in over 30 years of turning passions to careers!